If you celebrate St. Patrick's Day but have never made a leprechaun trap, then what are you waiting for? Legend has it that if you trap a leprechaun and look directly into his eyes, he has to tell you where he's hidden his pot of gold. So here's a sneaky leprechaun trap to help you get your hands on the little guy. If you have kids, this is a perfect holiday project to create together, and it provides an opportunity to share some holiday folklore. Do a little research on the history of St. Patrick's Day so that you can share that as well, while you make this fun and simple craft! The key element here is the gold! 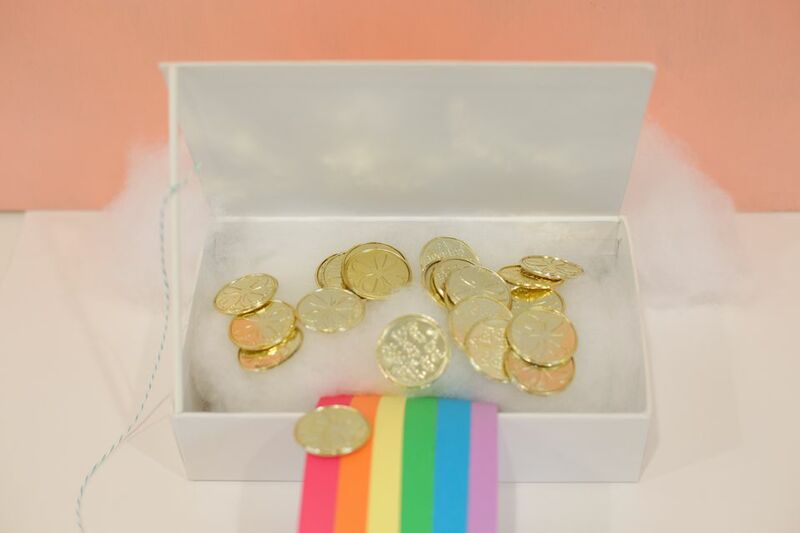 Find some fake coins to coax your leprechaun into the trap and you'll be good as gold. They typically stock them in dollar stores or party stores, which should make them simple to find. A dollar store is also a great place to find a blank pencil box, or something similar that you can use for your trap. Otherwise, you'll probably find that you have most of the materials right at home already. Start by stuffing the pencil box with the cotton batting, making it look full but not overstuffing. You want the lid to be able to close completely without having to press down on it. Then sprinkle some fake gold coins over the top of the cotton batting. We're hoping the fake loot will entice any leprechauns to hop right into the box! Use scissors to cut strips from your paper. Cut a strip of purple that's approximately 4 inches wide. Then cut blue, green, yellow, orange, and red strips that are each about a half inch wide. Use a glue stick to affix the rainbow strips onto the purple strip in rainbow order. Leave a half inch of the purple sticking out from under the blue to serve as the purple rainbow stripe. Trim any excess purple from the other side of the red so that you have a rainbow: red, orange, yellow, green, blue, purple. Take one end of the rainbow and tuck it into the box, resting underneath the cotton batting. Then apply a few glue dots to the underside of the other end and affix that end to the table or surface where you're creating your trap. If you'd like to make your rainbow road longer, repeat Step 4 and use glue dots to affix the second rainbow onto the end of the first. Then sprinkle the rainbow road with gold pieces. Cut a piece of string or twine that's about 10 inches long. Tie one end around the lollipop stick. Carefully stand the stick under the lid of the box so that it's propping the box open. 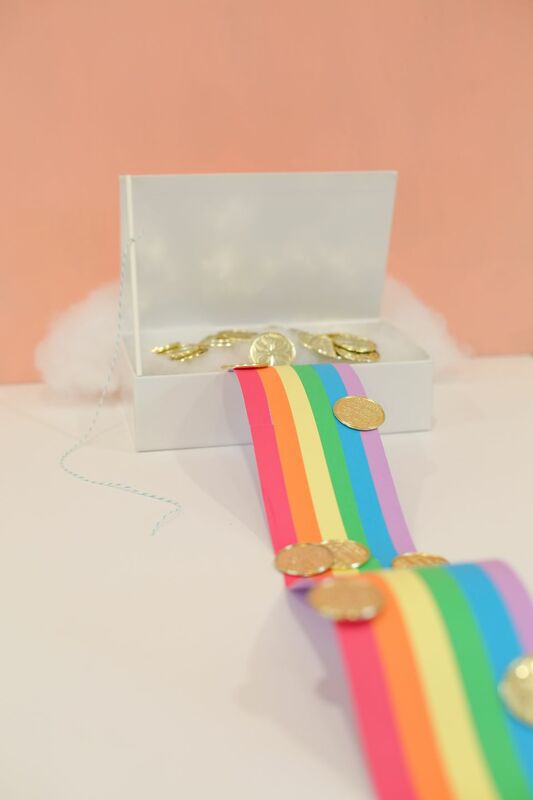 To trap your leprechaun, let him run into the box to collect the fake gold coins, then pull the string to release the stick and trap him inside. Good luck!